To stand on the floor independently,freestanding display cases come with solid attic or light chamber and lockable enclosed plinth for additional storage.Full-vision glass display space constructed by glass 4 sides to be secured onto lower robust steel plinth to acquire stable support.This design is ideal to transparent exhibition from all the four directions with no any vision obstacle.Attic light chamber with light diffuser filters UV/IR/heat from from omitted light from integrated lighting system.Lower lockable plinth works as additional cupboard for facility storage or additional exhibits storage.Applicable to the exhibition of small,medium and also larger artifacts. 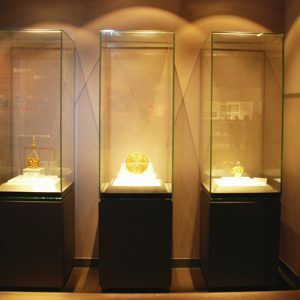 Display cases stand alone on the floor with no additional support,with showcase sizes to be customized. 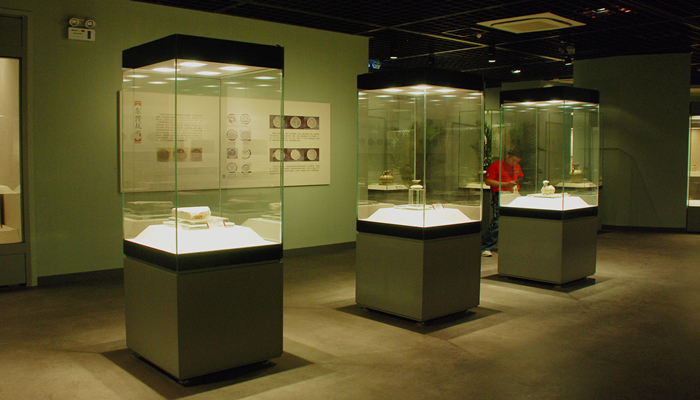 Usually 4 glass sides of glass front/back/left/right and solid top for all-direction exhibition with no any vision obstruction. Low-iron ultra clear glass or imported anti-reflective glass with reflectivity less than 1% and light transmittance more than 97%.High glass fabrication precision and polished glass edge. Glass panes are frame-lessly bonded by clear neutral UV sealants from Europe and to be cured with dedicated UV curing devices. Plinth to be built by low carbon square structural steel, seamless zero-oxygen welding,with folded steel panel cladded externally. 90° hinged opening or pull & slide opening for access into display space. Motor-driven and wireless remote-control system for options. Lockable enclosed lower plinth for lockable facility box for silicon gel tray for passively-controlled RH 40%-60%, or electronic microclimate system for actively-controlled humidity 20%-80% and air purifying.